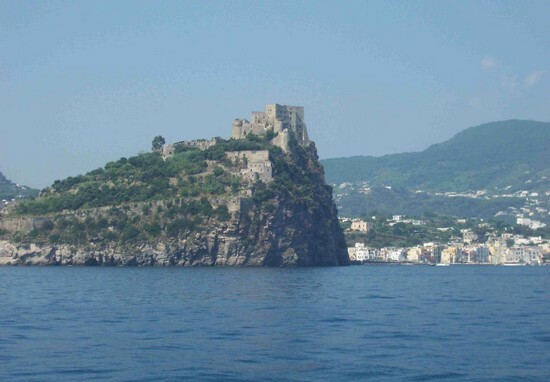 Beautiful beaches, thermal spas and a royal castle – touring around the island of Ischia in the Bay of Naples. Just short boat ride from Naples, the spas, beaches and natural beauty of the island of Ischia make it an outstanding vacation destination or romantic getaway on the Mediterranean Sea in southern Italy’s Campania region. Known as the Isola Verde, or the Green Island, Ischia is an island unique in the world for its thermal spas, mineral springs, sandy beaches and lush Mediterranean gardens. This once volcanic island has been an attraction in the Bay of Naples since ancient times when the Greeks and later the Romans discovered the relaxing and soothing effects of the island’s mineral waters and springs. Today the villages surrounding Ischia are home to many fine spas and resorts that take advantage of the island’s natural treasures. Larger than the island of Capri across the Bay of Naples, Ischia offers so much for the visitor, including relaxing in a spa, hiking in the mountains, exploring the villages and beaches around the island and discovering the mysteries and stories of the 15th-century Castello Aragonese. Let’s take a tour around the island and stop along the way to see some of the Ischia’s highlights. Ferry service connects to the towns of Forio and Casamicciola Terme on Ischia, but the most common point of arrival is the larger Ischia Porto on the eastern side of the island. This unusual circular port was once a crater lake that was opened to form a harbor in 1854 at the request of King Ferdinand II. Today ferries and pleasure boats come and go through the narrow opening into this pretty harbor, which is surrounded by restaurants. 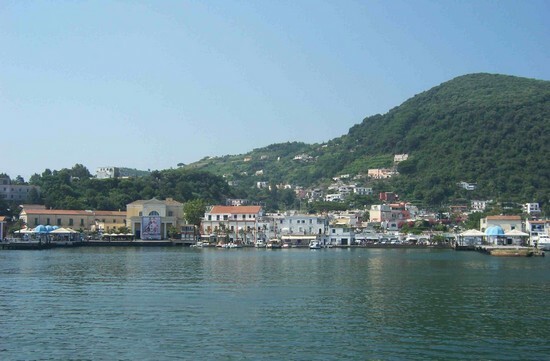 The lush, green mountainsides of Ischia rise up from the harbor and are a beautiful welcome to the Isola Verde. 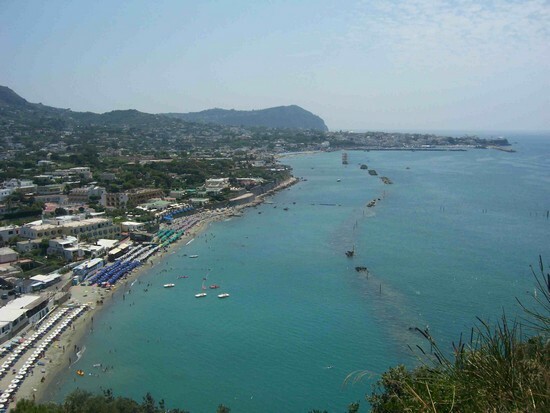 Ischia Porto is the island’s liveliest town for shopping, nightlife and the holiday scene. 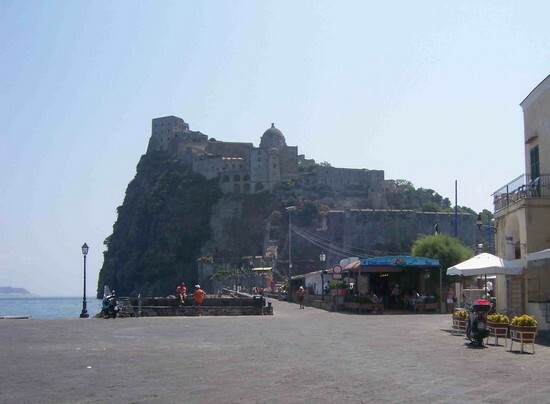 Walk along the shop lined streets until you reach the neighboring village of Ischia Ponte. 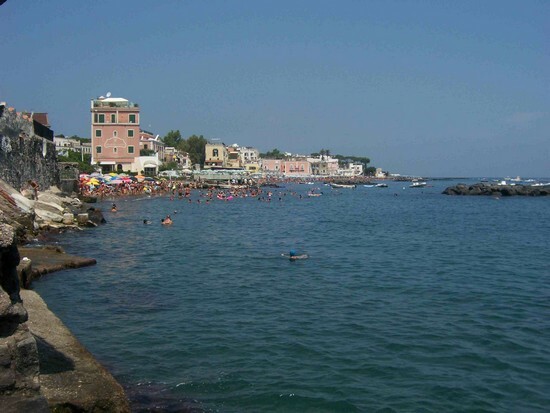 Along the way you’ll spot several beautiful beaches, including the pretty Spiaggia dei Pescatori – the Fishermen’s Beach. This is a pretty spot for swimming with beautiful views over to the nearby island of Procida. The village of Ischia Ponte has a quieter and less touristy feel, making it lovely spot to enjoy lunch overlooking the harbor. Explore the maritime history on the island at the Museo del Mare, the Museum of the Sea, before crossing the 15th-century Ponte Aragonese bridge to see the island’s most famous sight. The Castello Aragonese sits atop an impressive islet, which has been the site of a castle or fortress since the 5th century when the Greeks first arrived in the Bay of Naples. The Castello Aragonese was constructed in the 15th century by King Alfonso of Aragon, and the castle was used countless times as a place of refuge and protection for the royalty of Naples over the centuries. Filled with mystery and adventures from the past, today you can wander through and explore the quiet walls and passages of this castle and the surrounding churches and buildings. Exploring the island of Ischia is easy, because one main road rings around the island connecting all of the most popular seaside resort towns. Hire a taxi or hop on one of the buses that run in either a clockwise (#CS) or counterclockwise (#CD) direction around the island. Two of the most famous towns for thermal spas and resorts on Ischia are located on the northern coastline on the island, Cassamicciola Terme and Lacco Ameno. Here you will find many fine resorts overlooking the beach where you can enjoy the relaxing spa treatments in one of Campania’s most beautiful settings overlooking the Mediterranean Sea. 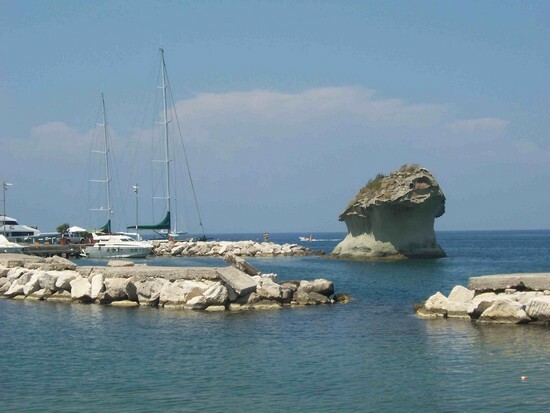 The town a Lacco Ameno is famous as well for its distinctive rock formation called Il Fungo, named after its unusual mushroom shape. The western coastline of Ischia is equally beautiful, and is home to the large beaches of San Francesco and Chiaia just north of the lovely town of Forio. 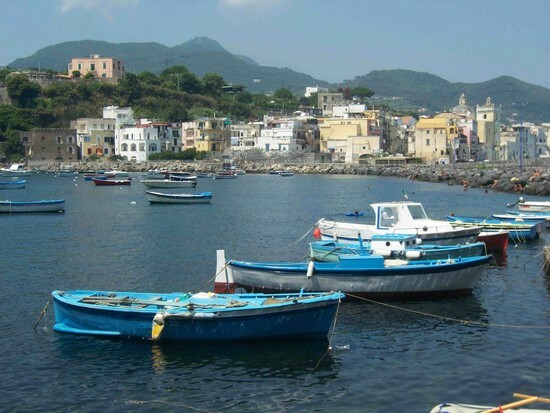 One of the pleasures of visiting Ischia is discovering the charms of each of the little towns surrounding the islands. There are many beaches to discover, including isolated areas in little coves that can only be accessed via foot or by boat. Forio is also home to the striking Chiesa di Santa Maria del Soccorso, a beautiful and simple whitewashed church located on a rocky promontory. The 18th-century majolica tiles outside the church provide a splash of color against the gleaming white façade. 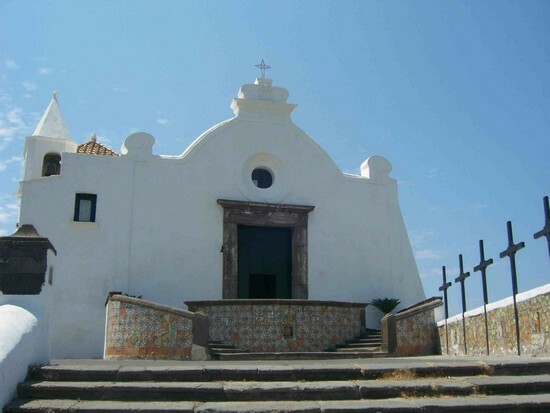 Walk around the church for gorgeous views north and south along the coastline of Ischia. The southern coastline of Ischia is less crowded and more mountainous, and is home to some beautiful beaches, including the island’s longest at the Spiaggia dei Maronti. The town of Sant’Angelo is a little fishing village that is today one of the most beautiful, chic and isolated destinations on the island. Set on the mountainside leading down to an isthmus, this traffic free village is located near hot springs and many fine spas. 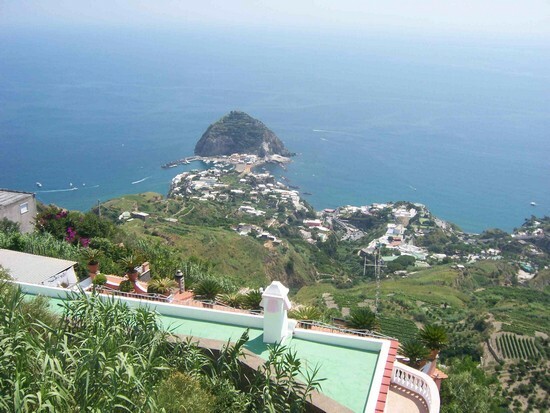 The rugged southern coastline of Ischia offers many fine hiking paths, including the climb to the top of the island’s highest point at Monte Epomeo. 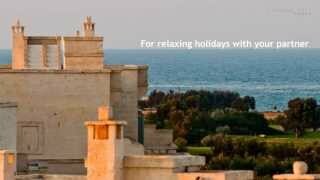 From there you can enjoy the fabulous views of the island and the entire Bay of Naples. No matter where you choose to spend your holiday on Ischia, you will enjoy a relaxing holiday surrounded by the intense natural beauty and thermal spas on this beautiful Mediterranean island. Discover the beautiful Italian region of Campania. 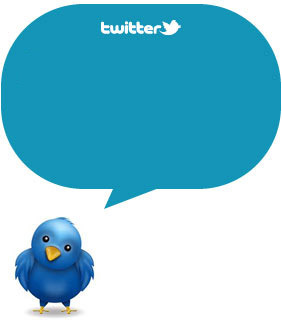 Subscribe to our RSS, follow us on Twitter and Facebook and we'll keep you updated!